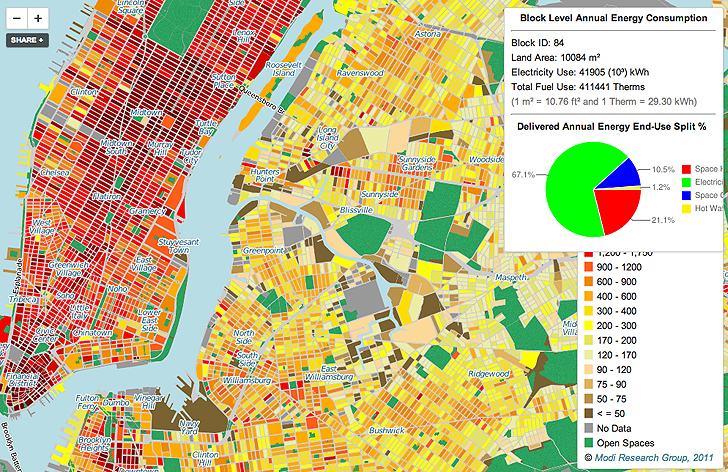 New York City urban planners now have an important tool to help create energy reduction plans. An interactive map of New York has been developed by the Columbia University Engineering School to show the energy consumption of individual buildings across the five boroughs. Users can select a building on the map, see how much energy it uses, and what it uses the energy for. The data will help planners initiate energy conservation programs and know exactly which buildings and areas to target. The study, headed by Vijay Modi, focuses on energy consumption divided by zip code. Modi’s team analyzed specific energy usage, determining exactly what each building’s energy was being allocated for. The numbers shown in the map are estimates, calculated through a statistical model that assumes that energy “end use is primarily dependent on building function.” The study used zip code level electricity and fuel use data reported by the Mayor’s Office of Long-Term Planning and Sustainability to come up with the energy usage amounts. The map and its run down of where and how energy is used will enable buildings to compare their consumption with others. It will also help building owners see what their energy is being used for most, allowing owners to assess their own conservation needs and make appropriate changes based on the areas of higher consumption. Modi hopes the map will also encourage conversation with other building owners in the area, possibly spurring partnerships to share resources, like installing solar panels or other green energy structures. Buildings in New York City account for around two-thirds of the city’s energy usage, and this new map is an important step in making this information readily available and helping create a more energy efficient New York.